To: Commanding General, 30th Division A.E.F. Subject: Co-operation from British enlisted men. 1. Following our converation of a few days ago, it has been my pleasure to secure for you the names of the four British enlisted men who were such a great help to us during the early morning hours of August 27th 1918, at Belgian Battery Corner Advanced Dressing Station. The above four men are members of the R.A.M.C., and were assigned to us by the Commanding Officer of 134th Field Ambulance (British) as instructors to our own enlisted men. 3. Sergeants NUTTER and UNWIN, assisted by one Medical Department Sergeant (American) supervised the evacuation of wounded and gas patients from the forward area to the Advanced Dessing Station, each of them being placed in command of a group of reserve stretcher bearers, and assigned to one of the Regimental Aid Posts during the emergency. L/Corpl. MILLWARD ably supervised our force of enlisted men assigned to the Dressing Room on this occasion, and Private LAWSON was so careful and energetic in superintending the making of all necessary records that even in the rush accuracy was maintained. 4. To these men, with their experience of several years in the War zone, the rush of patients that followed our gas attack was not an unusual occurance, but it was the first experience of this kind which these American soldiers had undergone. The calm and efficient work of these British enlisted men did much to prevent unnecessary excitement and give self-confidence to our men when they were called on to meet this emergency. BRIERCLIFFE SERGEANT CARRIES WOUNDED SOLDIER TWO MILES. As we announced on Wednesday, Mr. and Mrs. Nutter, of Scarrs Farm, Brierciffe, have recently learned that their son-Sergt. 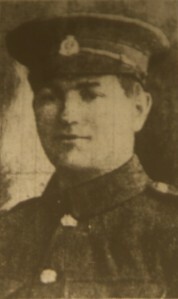 James Nutter, of the R.A.M.C.-has been awarded the military medal for gallantry and devotion to day while in France. Sergt. Nutter was brought up at the above farm, and as a lad attended the Briercliffe Council School for seven years, and then the Burnley Grammar School, while later he spent two years at the Chester Training College for Teachers, at the close of which period he became a teacher in St. Paul's School, Burnley, but he has been engaged in scholastic duties in Durham for the last five years prior to enlisting. It was only in September, 1915, that he enlisted as a private, but by Easter, 1916, he had become a sergeant. During last August, he went to France, where his devotion to duty and his rapid removal of wounded from the trenches has repeatedly earned him compliments from his superiors. Sergt. Nutter-a fine specimen of healthy manhood-is very modest about his exploits, and very little more can be got from him other than "there is a lot to do, and I try to relieve all the suffering I can." However, one incident has become known, which is as follows: - "On October 23rd and 24th, he and his stretcher-bearers had worked hard, with very little food for two days, fetching in wounded till quite dark, then there was one wounded soldier left for whom there were no bearers. Sergt. Nutter carried the man on his back through the sticky mud, about eight inches deep, for two miles. He spent two months in those trenches without a break. A spell of influenza forced Sergt. Nutter to the hospital, but he is now all right, and is attached to the School of Sanitation as an instructor. It was on New Year's Day when he received the ribbon for his medal- a very auspicious beginning of the year. There are three other brothers serving in the Army – Pte. Henry Nutter is in the R.H.A. attached to the Anti-Aircraft guns; Pte. Geoffrey Nutter, also Ant-Aircraft Section; an Pte. Eric Nutter who is in the R.H.A. at Woolwich.